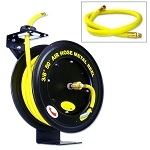 Retracting Air Hose Reel-100 ft. x 3/8 in. 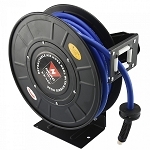 Loose hoses are a hazard on the workshop floor, especially long hoses with loops or coils that are hard to manage. 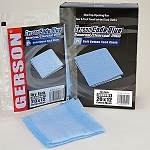 Hoses on the floor can also get damaged, resulting in decreased air pressure and effectiveness of your air tools. 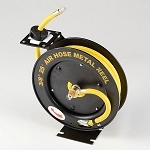 Improve both convenience and safety with a retracting air hose wheel. 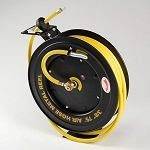 At Rich Tool Systems, we have several kinds of retracting air hose reels for you to choose from, capable of handling hoses from 50 ft. up to 100 ft. They are manufactured to high standards for durability and reliability and can be mounted to the floor, wall, or ceiling. 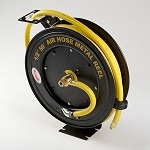 Hoses lock in place and are protected to reduce wear. Hose included, or replace it with one of your own. Rich Tool Systems has everything you need to ensure the smooth operation of your workshop, whether professional or hobbyist, and our prices can’t be beat.